Grew Up… coddled by wealth and luxury. His father, Brian, is the successful CEO of Madison Hotels. While Billy was in school, his dad secretly bribed all of his teachers so that he could pass each grade; Billy wasn’t the brightest of students. Living… on his dad’s estate. Billy and his best friends, Jack and Frank, are constantly causing mayhem, and spend most of their days drinking. Billy spends a lot more time in the pool than in any sort of workplace. In fact, the idea of work is a completely foreign concept to Billy. He assumes he will succeed his dad as CEO of Madison Hotels, but when Billy ruins his father’s dinner meeting, his dad loses all faith in him and chooses the conniving vice president of the company, Eric Gordon, to be the next CEO. Profession… student. Billy wants his dad to reconsider appointing Eric instead of him as the next CEO, so the two reach a compromise: Billy has to prove he's intellectually competent by passing all 12 grades of primary school in 24 weeks. So now the adult Billy is back in school, squeezing into those tiny desks. Relationship Status… in love with Veronica Vaughn, a third grade teacher, who is initially repulsed by Billy's eternal adolescence. However, when he sticks up for a fellow classmate, she's genuinely impressed and wonders if there is more to this man-child than meets the eye. Challenge… passing all 12 grades so he has a chance of impressing his father and taking over Madison Hotels. Unfortunately, the shady Eric hates Billy and doesn’t think he deserves the coveted CEO position. In order to stop him from succeeding, Eric is doing everything he can to sabotage Billy’s efforts. Personality… slightly immature and pretty dumb, but Billy makes up for it by secretly having a heart of gold. Though once the bully, going back to school and being a “loser” for the first time gives Billy a new perspective on how he treats others. 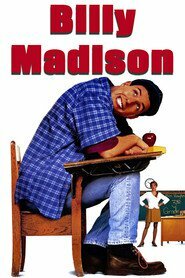 Billy Madison's popularity ranking on CharacTour is #2196 out of 5,000+ characters. See our top-ranked characters and read their profiles.